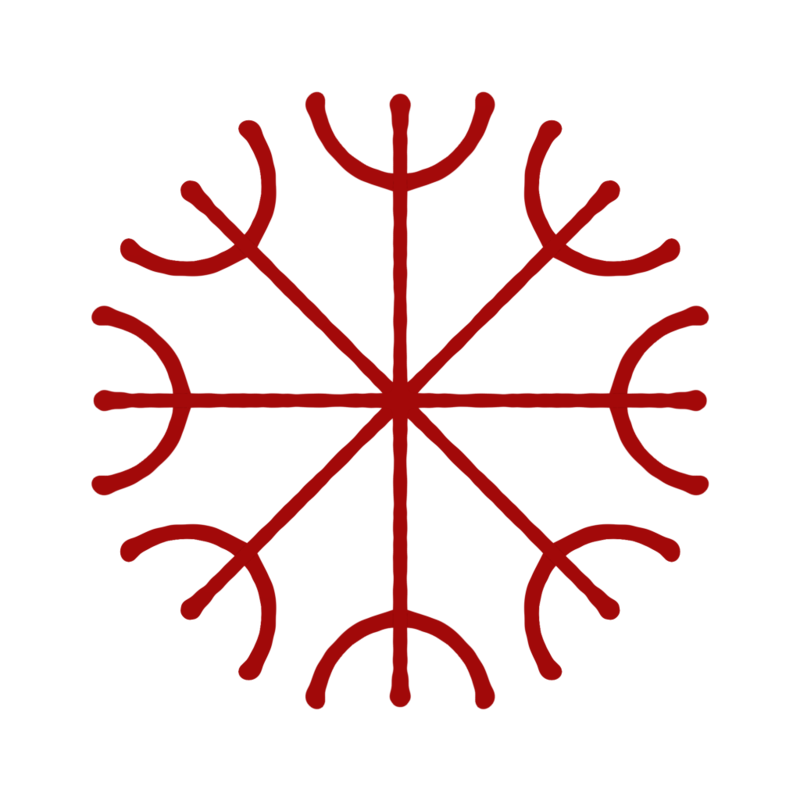 Galdrastafir.org was initially created by Ræveðis as an online platform to share his work on norse esoterics, and in particular Scandinavian magical staves / sigils (Galderstave). 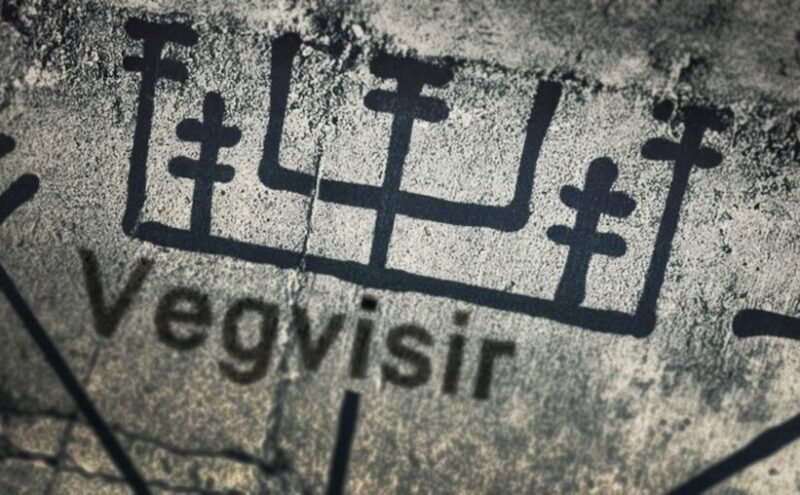 While Ræveðis remains the owner of the domain, the site is currently run by The Fornalder Society (Fornalder Selskabet) with Ræveðis acting as a primary consultant and source of graphical material. 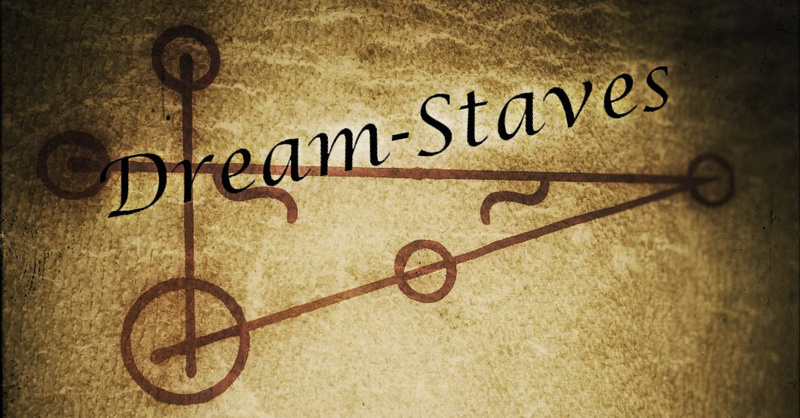 Staves to win a girl whom you love. 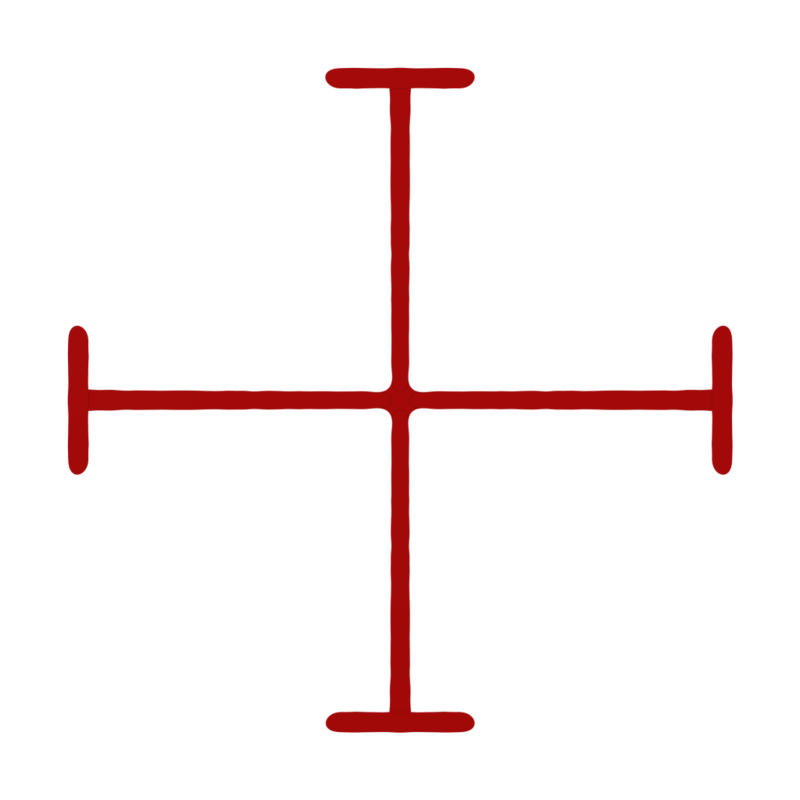 The staves are meant to be drawn on your right hand palm, using blood drawn from the tip of your left thumb. upon your will I will play. may thine bones thee burn. 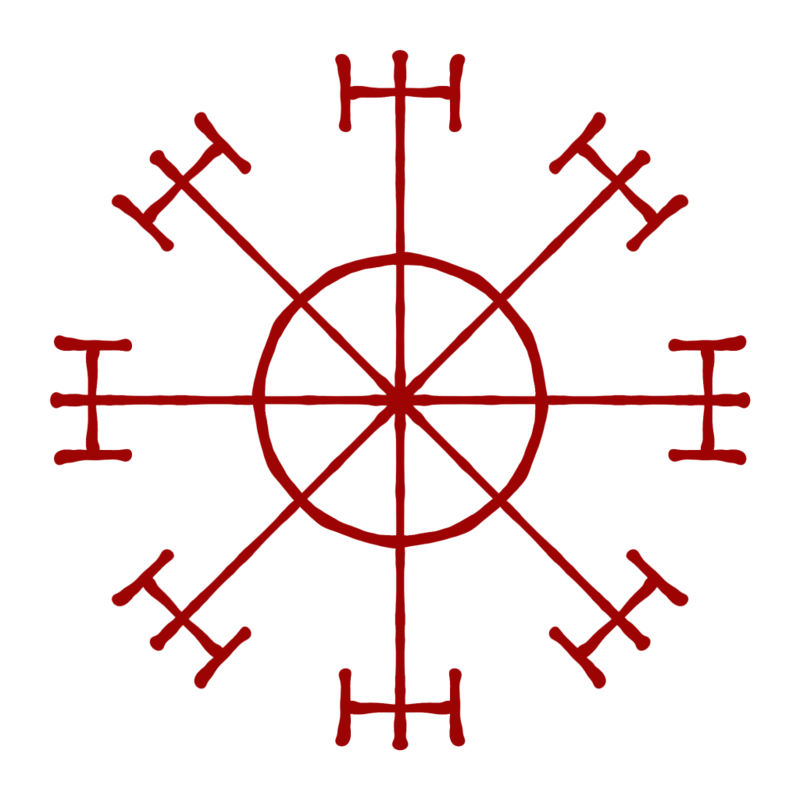 all those who dwell below aid me in this! 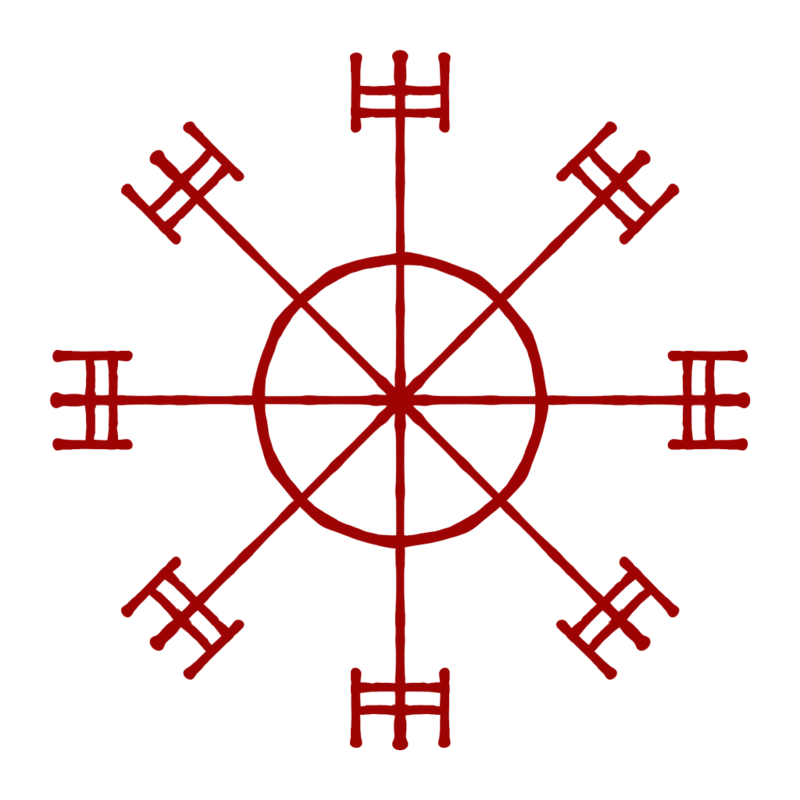 The Vegvisir as seen in The Huld Manuscript. 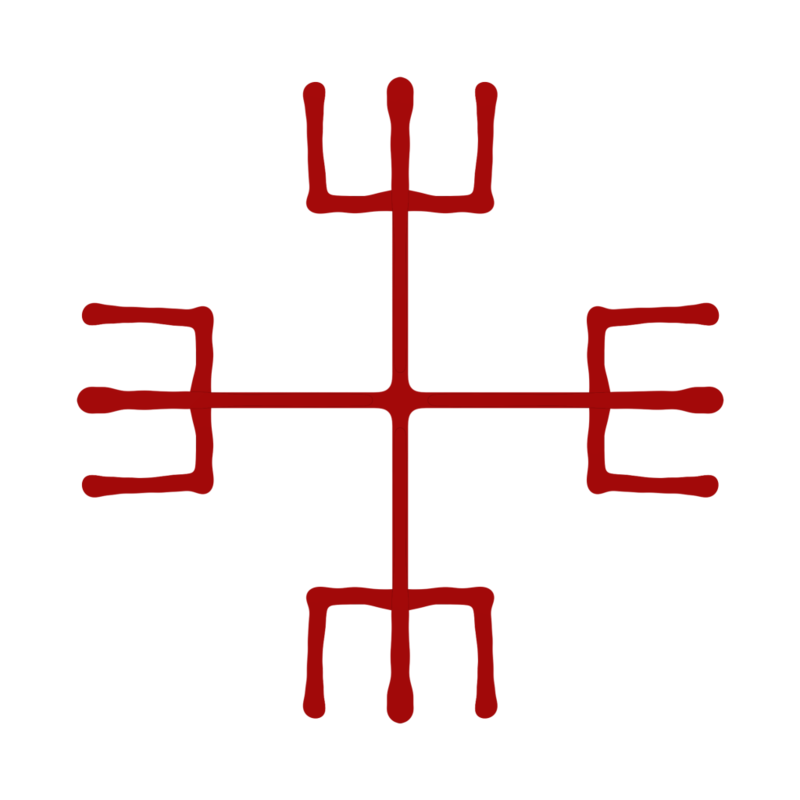 These galdrastafir are said to help the user find his or her way by sea or land in harsh conditions, even when the road is not known. 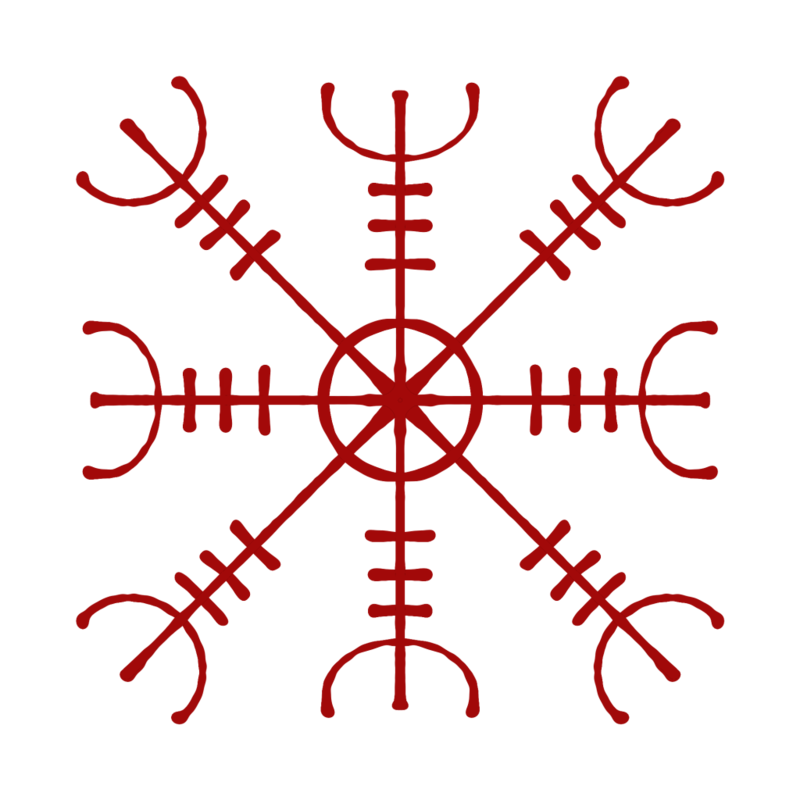 In modern esoteric use, the Vegvisir is often used in a more metaphoric sense to help the user find his or her way on their spiritual path. 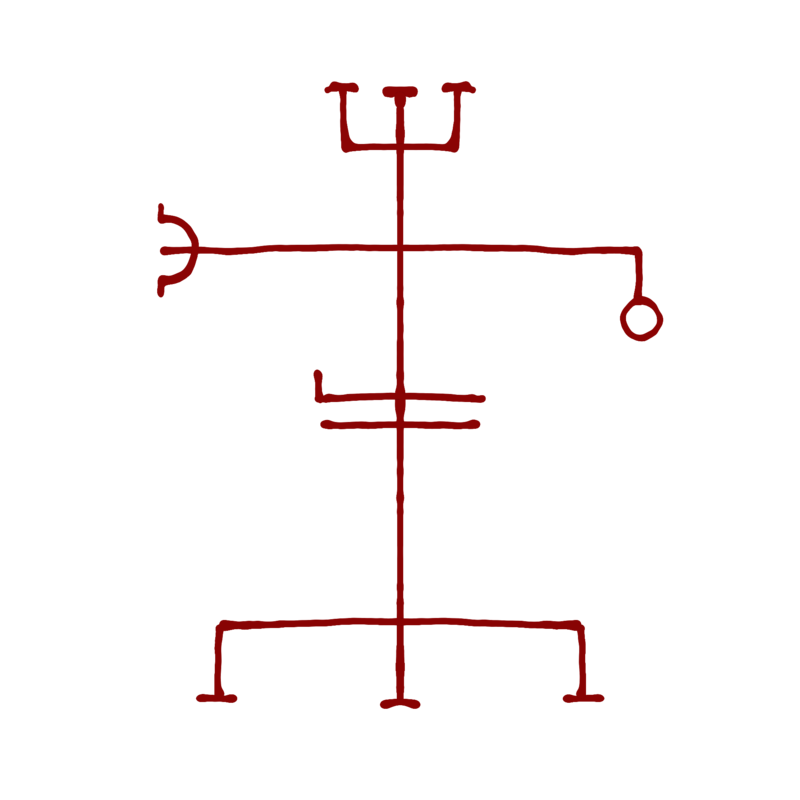 For this reason it has become a popular choice as a spiritual tattoo. 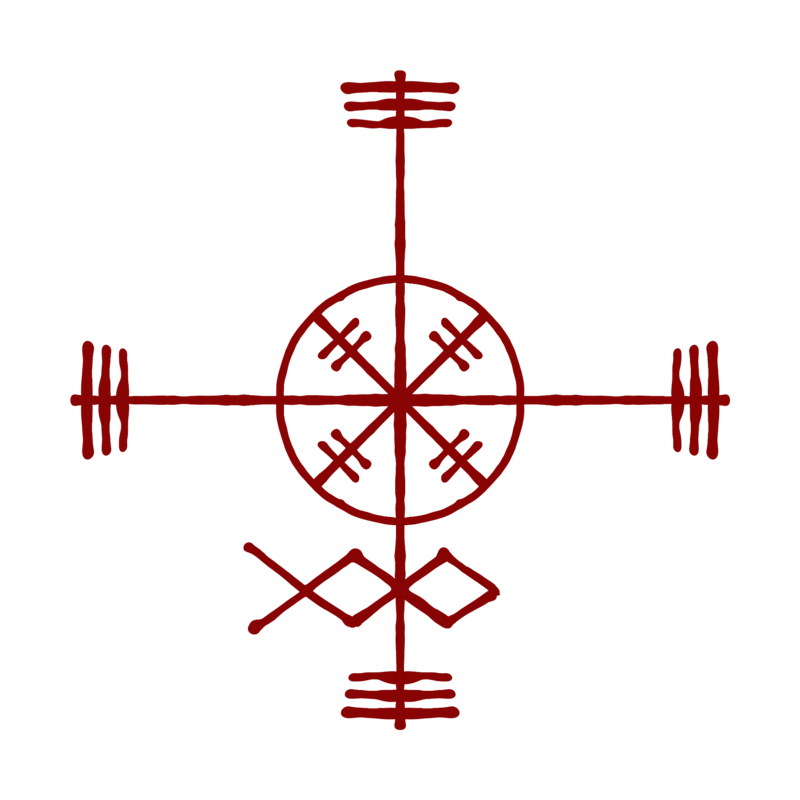 If you are looking for a tattoo-stencil of the Vegvisir, please feel free to use the image from our website and use it for free. You can find it in high resolution, among several other designs, in our gallery. 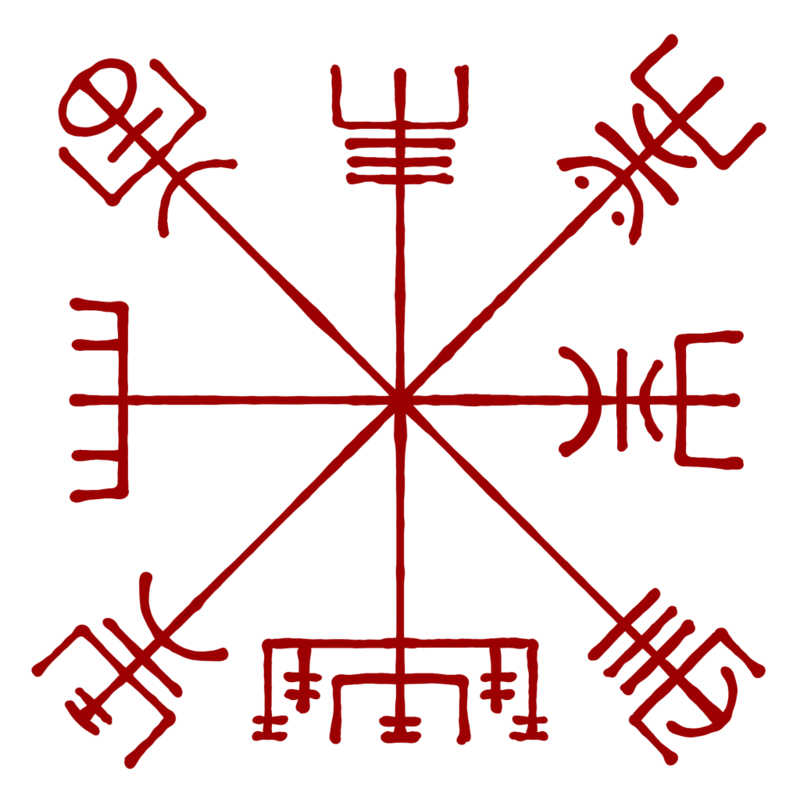 Several versions of these famous galdrastafir can be found across several historic manuscripts, and have later spawned several modern iterations. 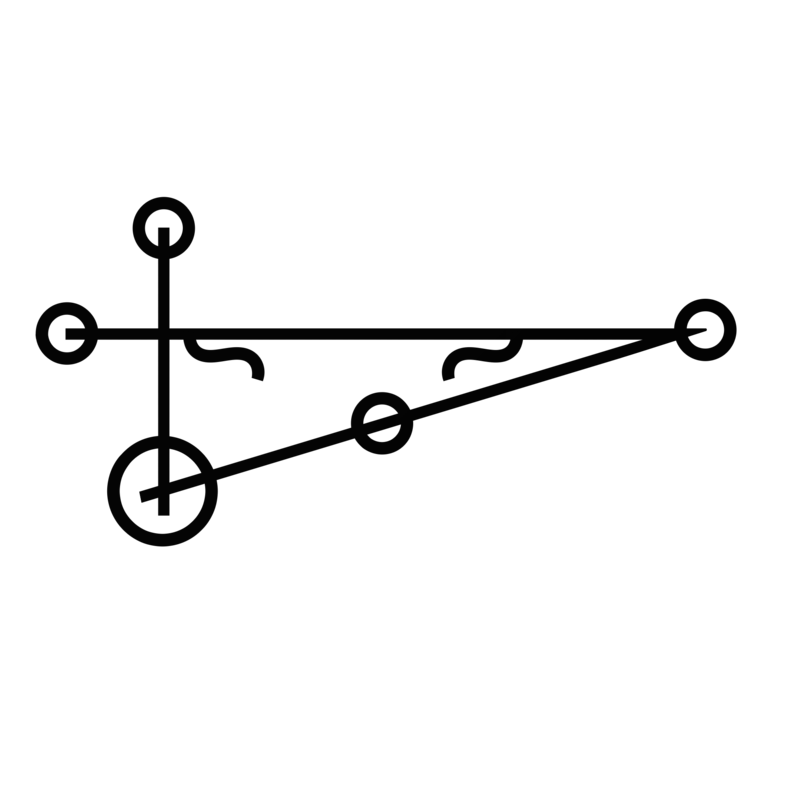 The most popular variations of these are based on eight-spoke wheels such as the one seen here, but several non-symmetrical variations are also known. 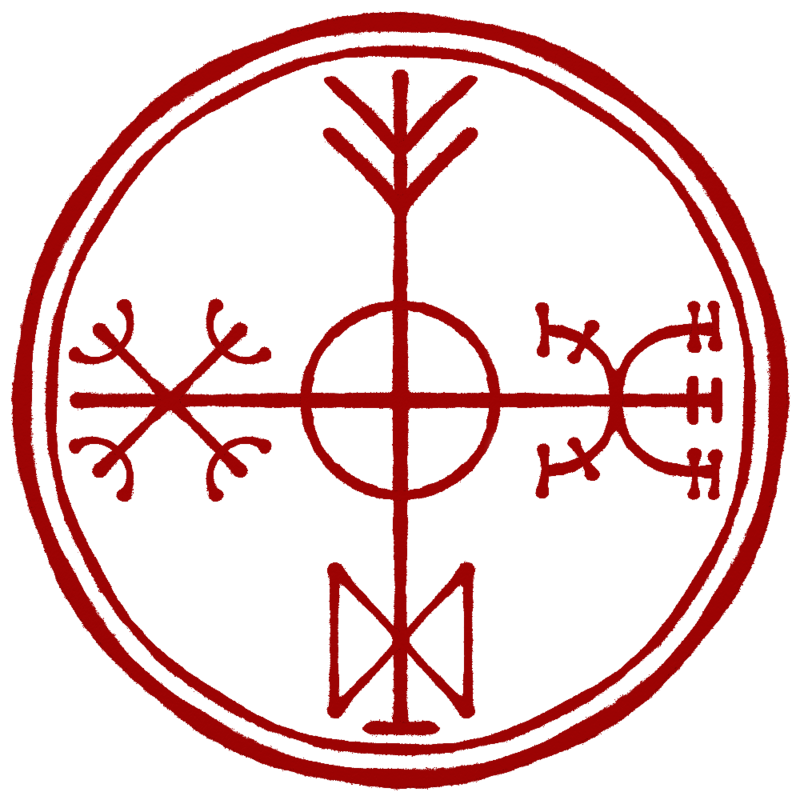 In some modern heathen, pagan and esoteric literature (and on social media / internet sharing sites etc.) 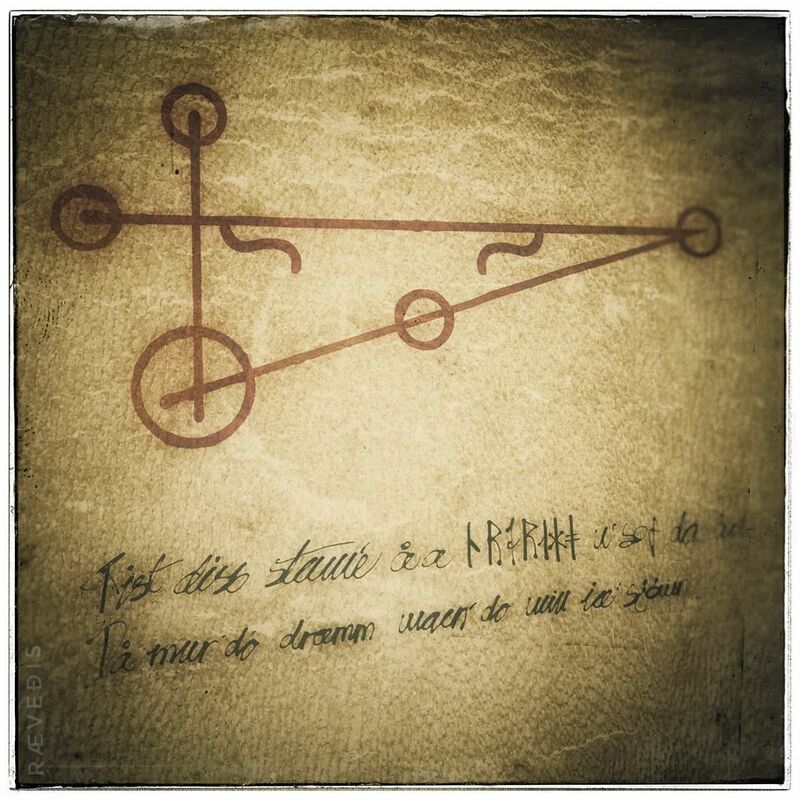 these staves will often be referred to as “The Viking Compass” or “The Runic Compass”. This often appears to be based on the notion that Vikings used these staves to navigate their ships, and that the spokes of the staves are representative of compass directions. There is, however, no evidence to support this theory, although some people will insist upon it. 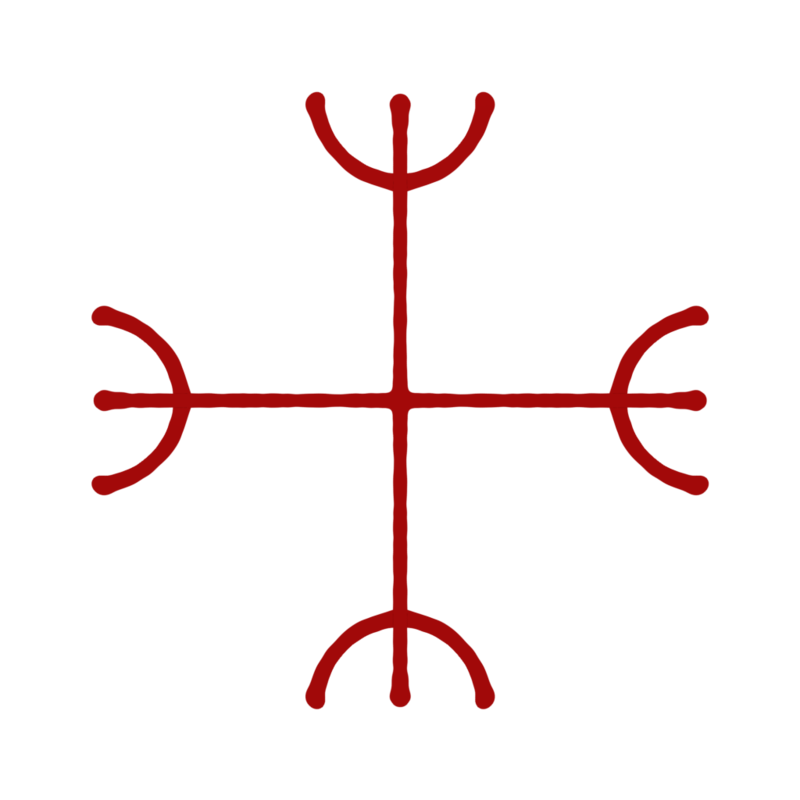 There are in fact no traces of this symbol in any historical Viking-finds, and all research into the origin of this symbol points to a fusion of European renaissance magic and Norse folk-magic. 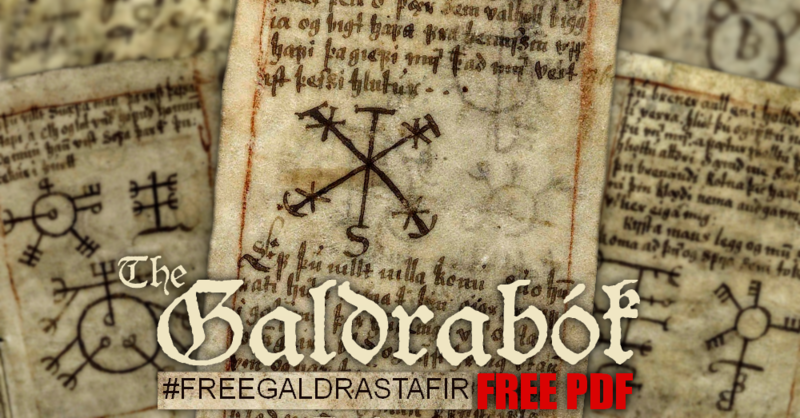 This is the remastered version of the third document of The Galdrablöð Manuscript (JS 375 8v – blad 3). 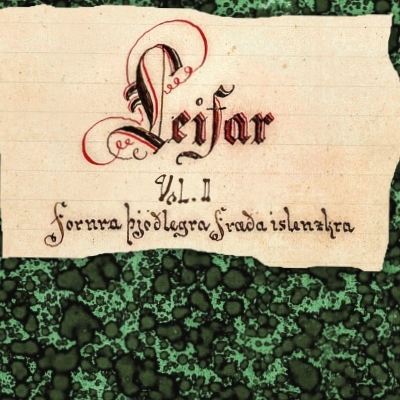 The manuscript, as it’s archived in the Icelandic historic national library, is made from several documents, each comprised of several pages, and written by different authors of unknown identity. The digital scans used for the PDF document we present here, have been edited and enhanced for optimal presentation in PDF format. If you are researching, looking for inspiration or simply browsing, feel free to explore our gallery. 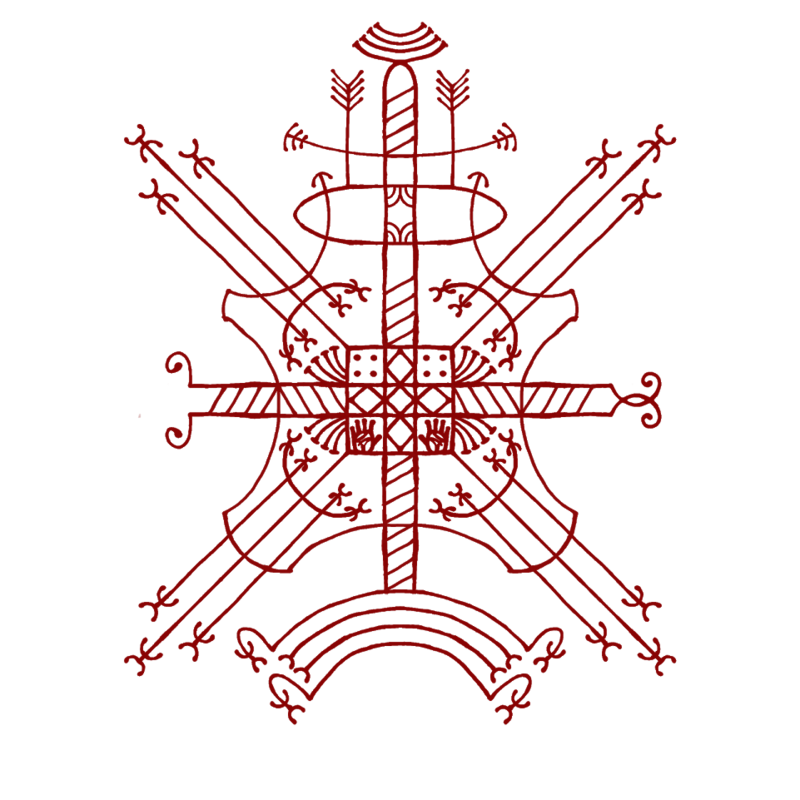 If you wish to download a particular design to your device, click on the thumbnail in question to open the full resolution file attachment page. From here you should be able to download the image in full resolution. 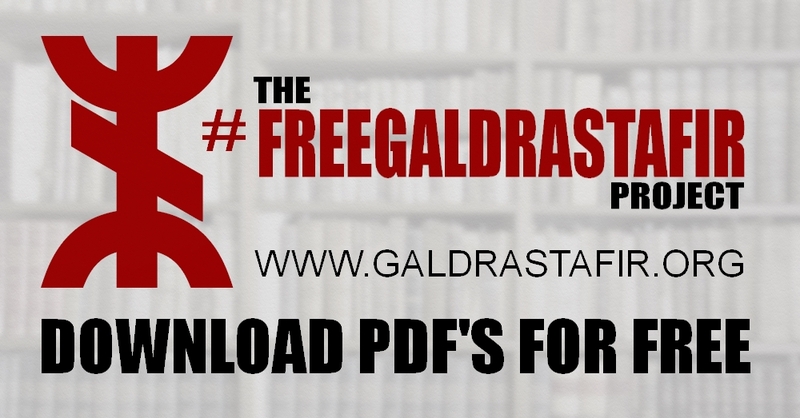 As a part of project #freegaldrastafir we have decided to make all manuscripts available for easy download from our servers. The purpose of the project is to make as many manuscripts as possible available in as high quality as possible for digital download. We strongly believe that these old manuscripts are to be freely available in digital form, so we present them 100% free for anyone who seek them out. Anyone is free to download these files and use them as they see fit. So feel free to redistribute these manuscripts, share links or even print them out and make your own physical copies from the PDF-files supplied. 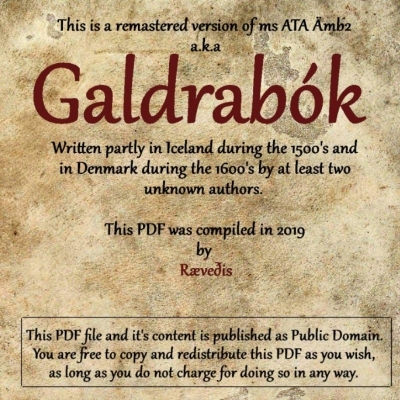 This is the remastered version of the original Galdrabók manuscript (ATA Ämb2). The content have been edited and compiled into a single PDF format for easy access. 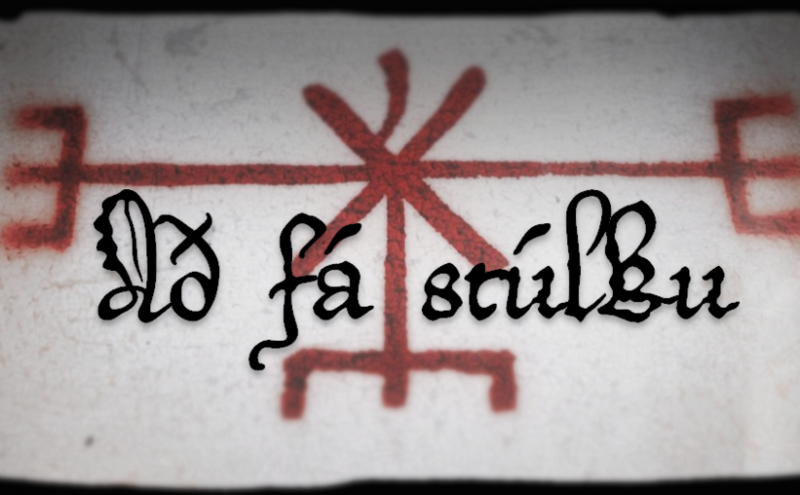 A remastered version of the popular Huld Manuscript (ÍB 383 4to). This enhanced hi-resolution copy was edited and compiled into PDF format for easy access and free distribution. 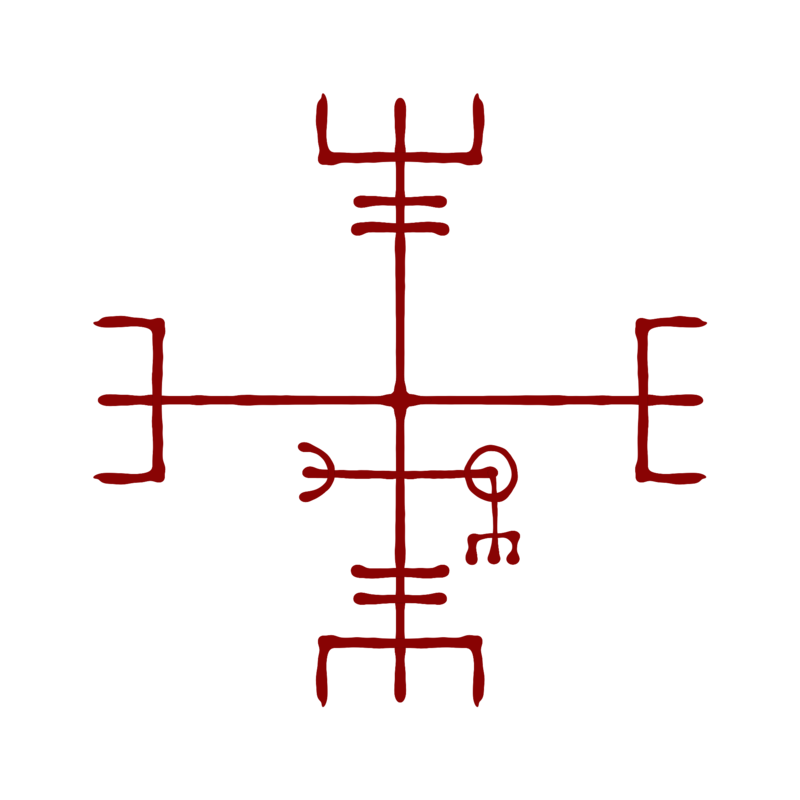 Remastered version of The Galdrablöð (JS 375 8v blad 3). 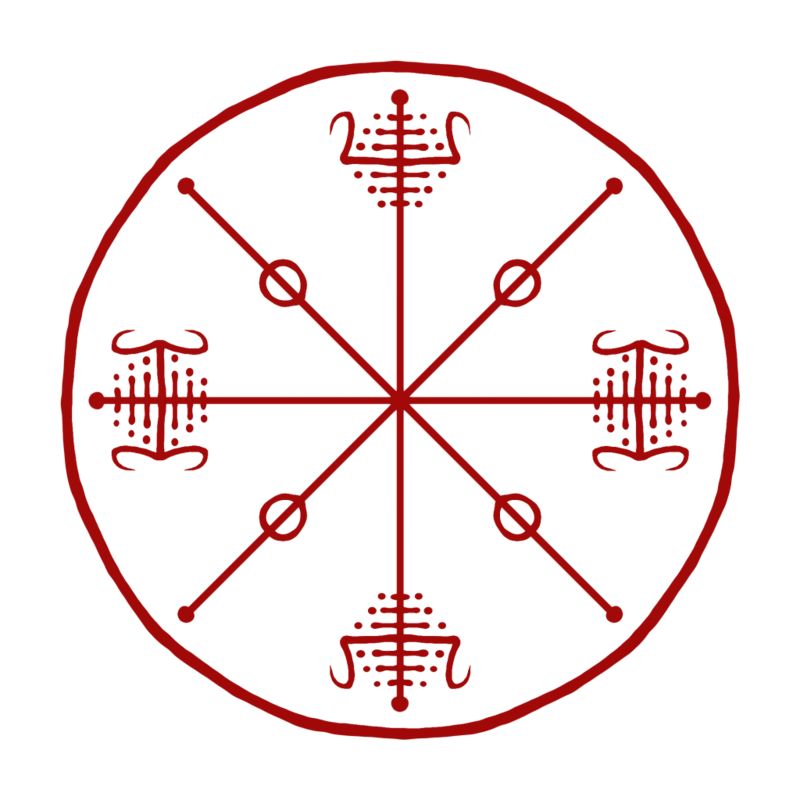 The original manuscript is a compilation of several manuscripts compiled together. In an effort to optimise file-sizes, the manuscript have been split into it’s original parts again. All volumes have been edited and graphically enhanced for best quality, and compiled into PDF format for easy access. 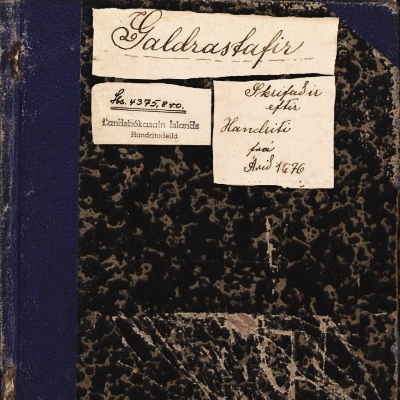 Remastered version of The Galdrastafir Manuscript (Lbs 4375 8vo). 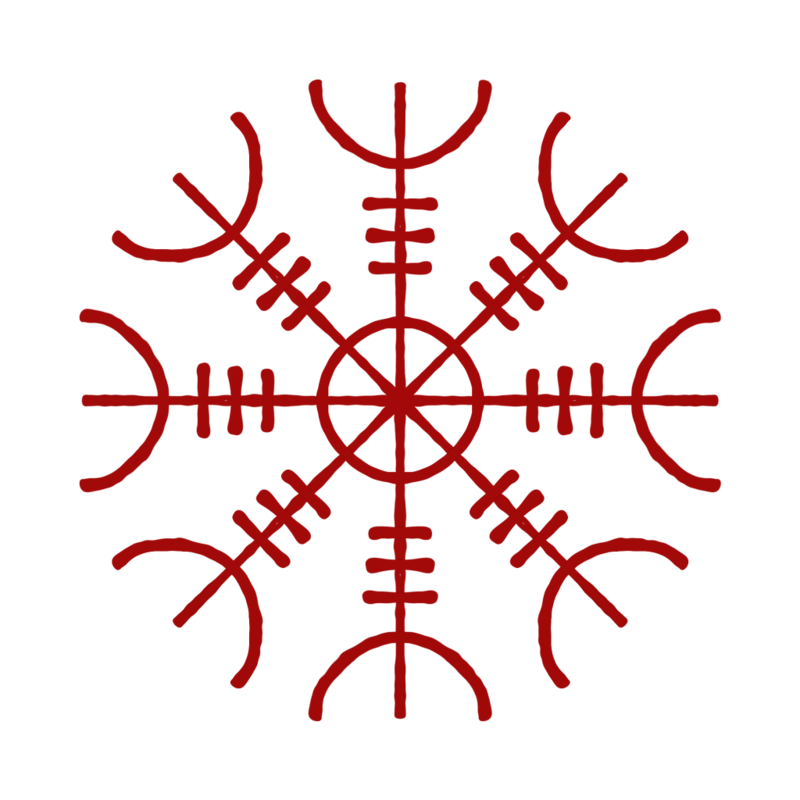 The PDF have been edited for better quality and presentation and made available for free by Ræveðis. 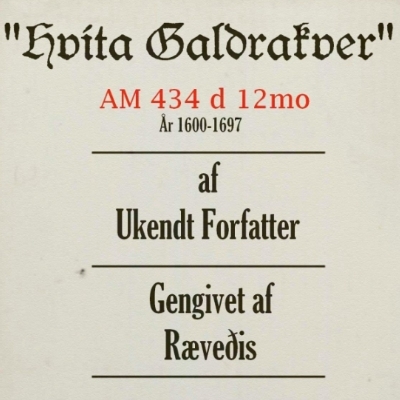 This version of Hvíta Galdrakver (AM 343 D 12mo) have been edited and optimised for best possible quality by Ræveðis. The entire manuscript have been compiled into a single PDF file for easy access. 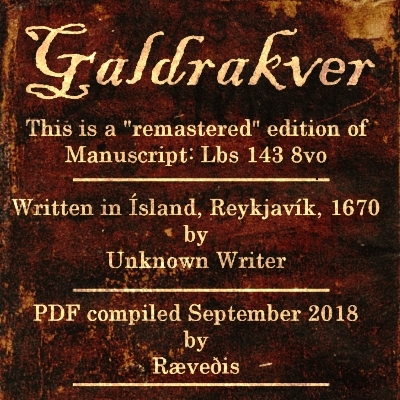 The Galdrakver Manuscript (Lbs 143 8vo). 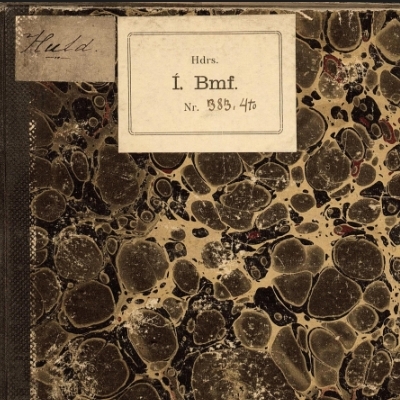 This remastered version have been edited and compiled into a single PDF for easy access. 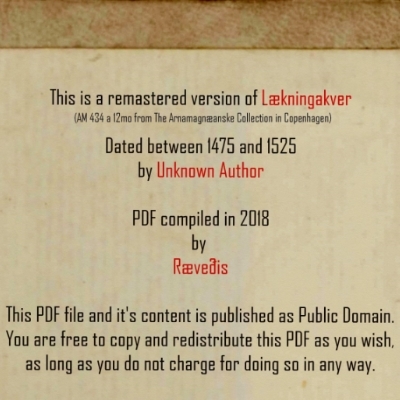 A remastered version of The Lækningakver Manuscript (AM 434 a 12mo). Edited and compiled into PDF format by Ræveðis for easy access. Please feel free to copy, share and redistribute this file. 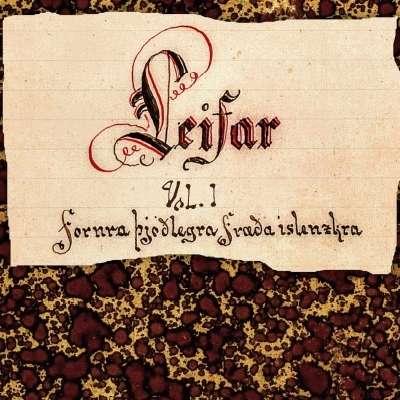 Remastered version of the Leifar manuscript (LBS 3902). Due to the huge size of this document, the content have been split into four volumes. All volumes have been edited and graphically enhanced for best quality, and compiled into PDF format for easy access. 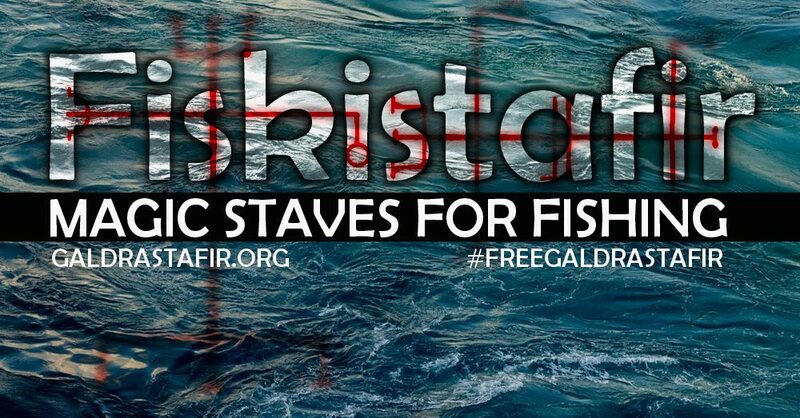 These files are free to download and redistribute. If you find anyone online who are selling digital copies of our supplied PDF material, please help making other aware that they can be found for free right here! 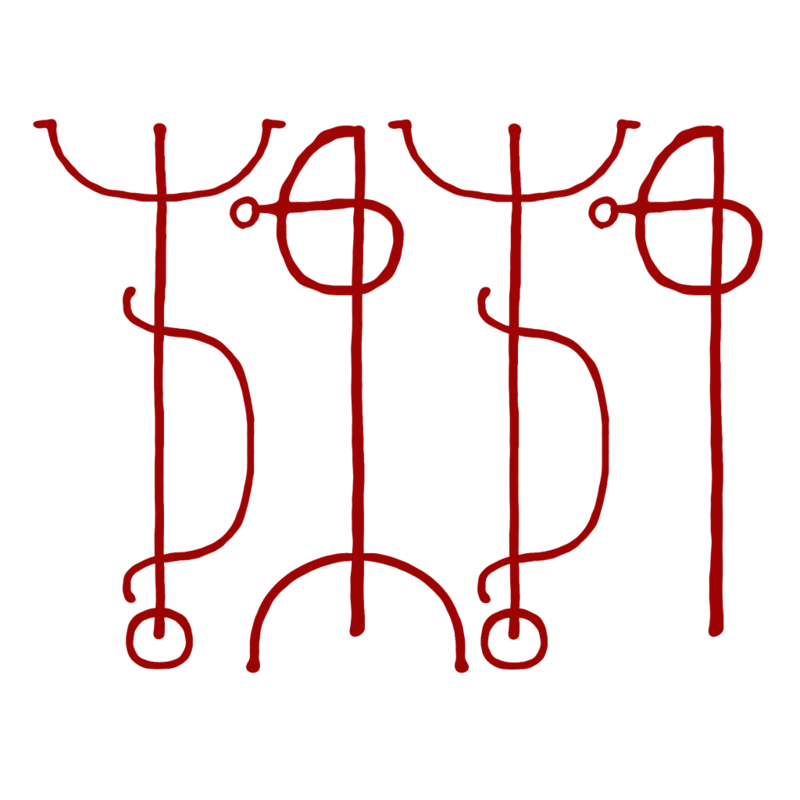 This is a PDF version of the infamous Galdrabók (MS ATA ÄMB2). This book is often referenced in modern work such as Stephen Flowers’, but the manuscript itself is actually really hard to find in its original form. 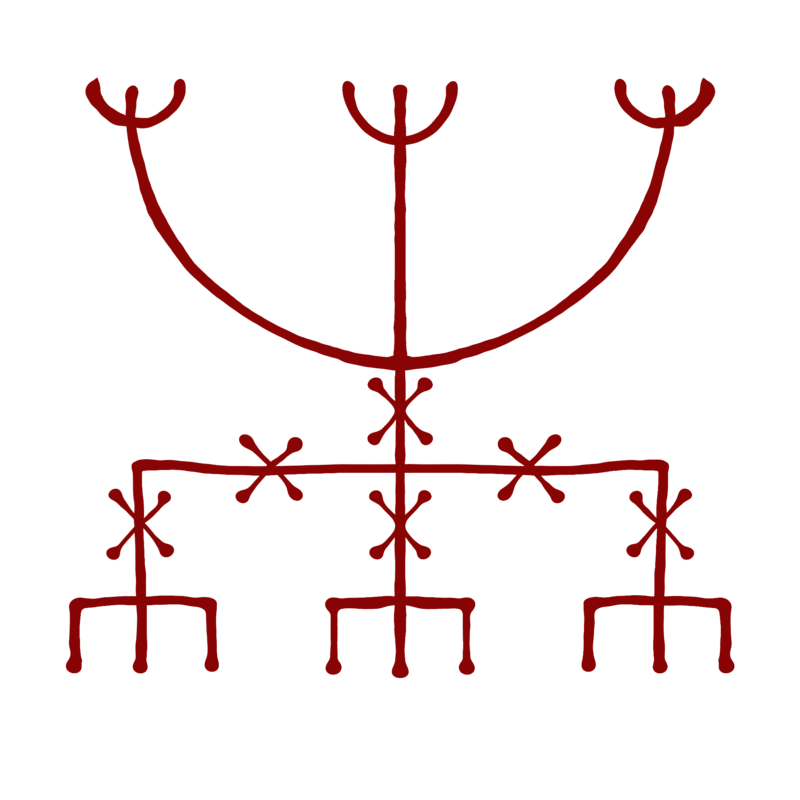 As I’m sure you guys know, there’s not many of these old Galdrabóks left today. 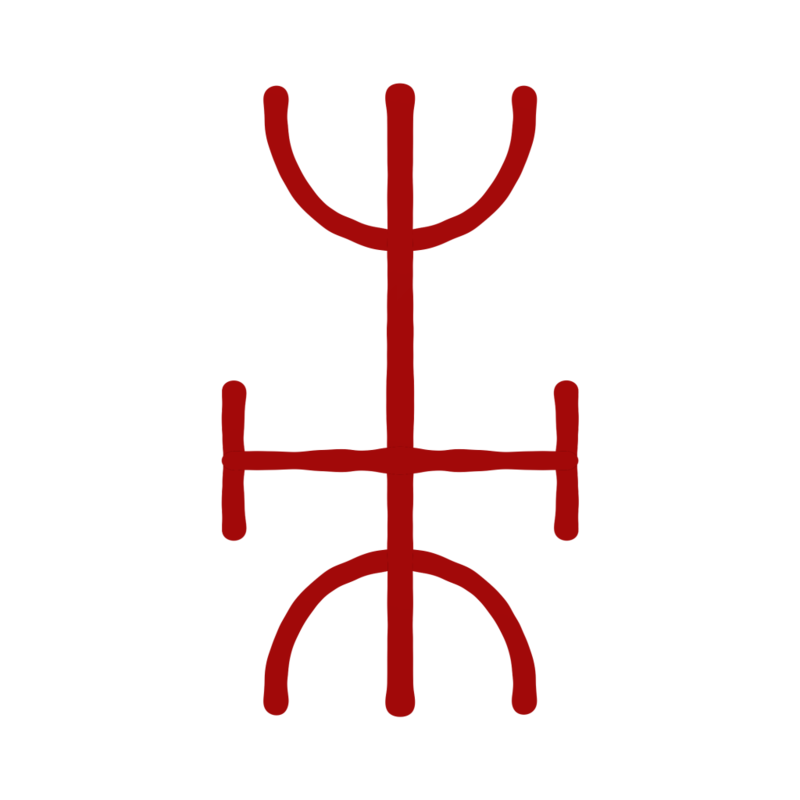 Many were burned as heretic books and others were hidden away by their owners to later be forgotten and decay into nothing in some nameless hiding-spot. 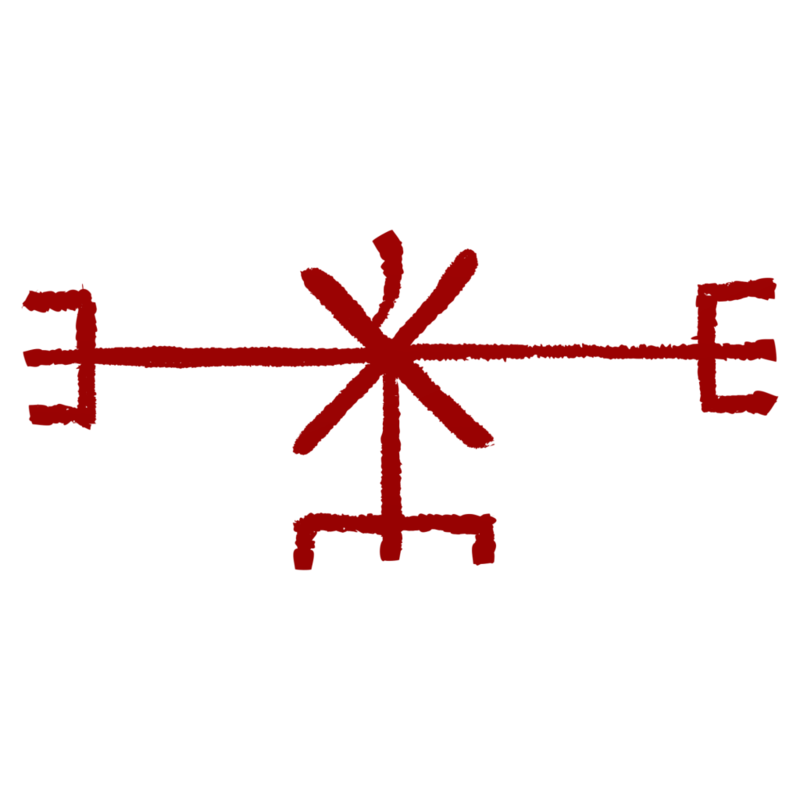 Those that have survived however, can now be found stored away in several Scandinavian archives, while others are tucked away in private collections. Back in the day, there were a lot of rumours of black art books like this one in existence. 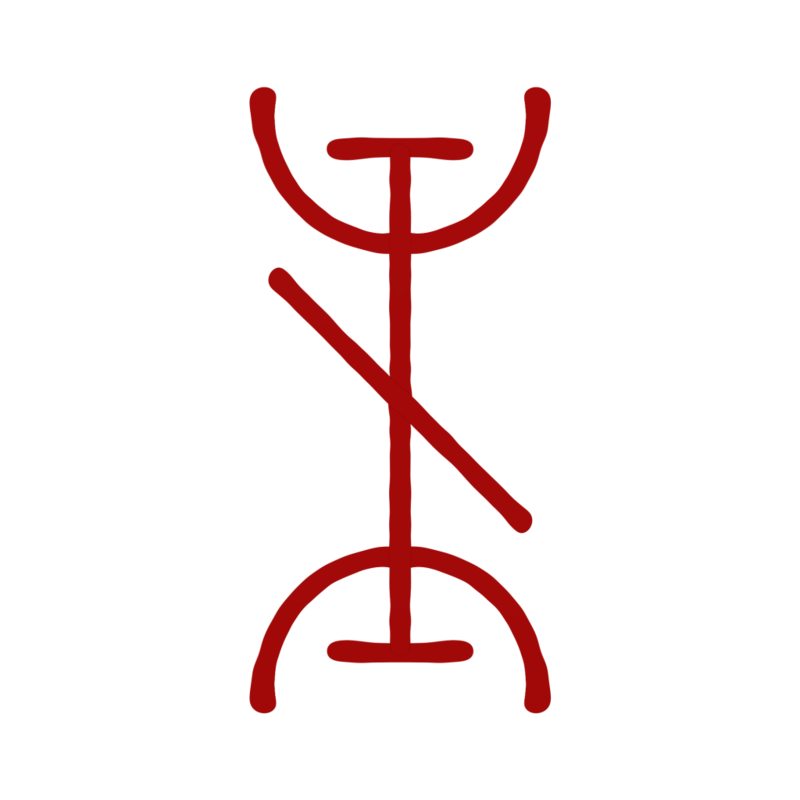 Books said to contain powerful magic in the form of depicted Galdrastafir, Spells, Troll-runes and more. 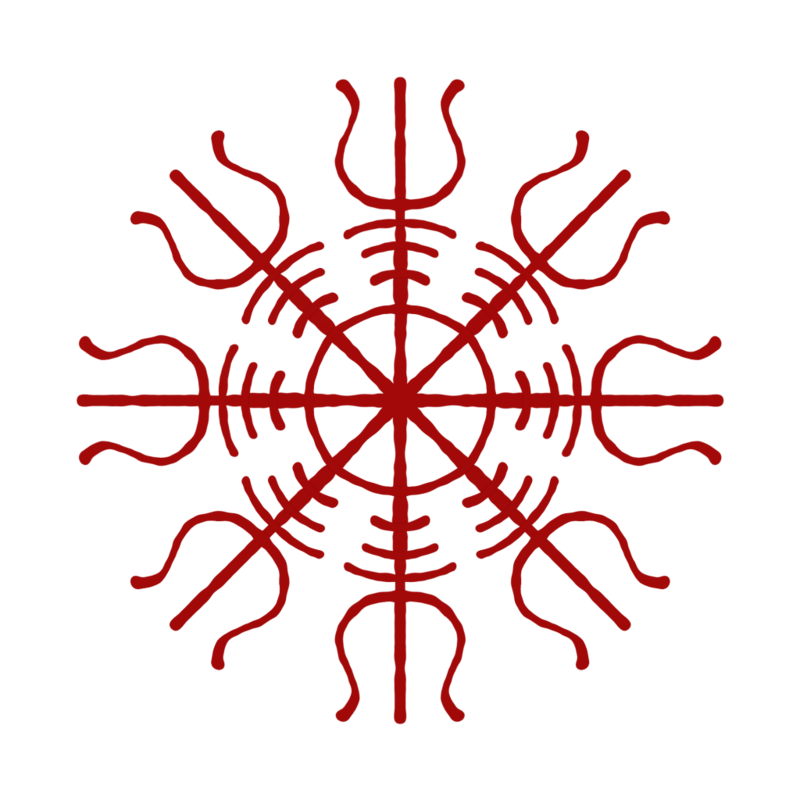 One of the most famous historical manuscripts of this kind is the mythical “Raudskinna” (Red Skin). 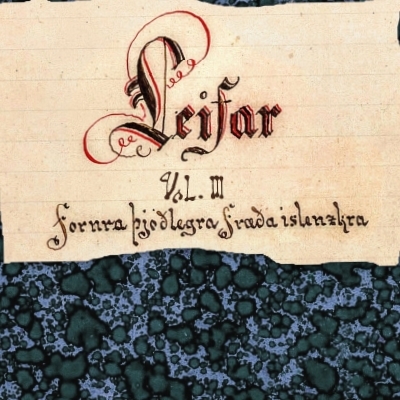 This fabled manuscript was said to have been written by the Icelandic bishop Gottsálkur Nikolásson (1498-1520’s), who was considered a very cruel man, and also one of the most powerful Troldmænd of his time. 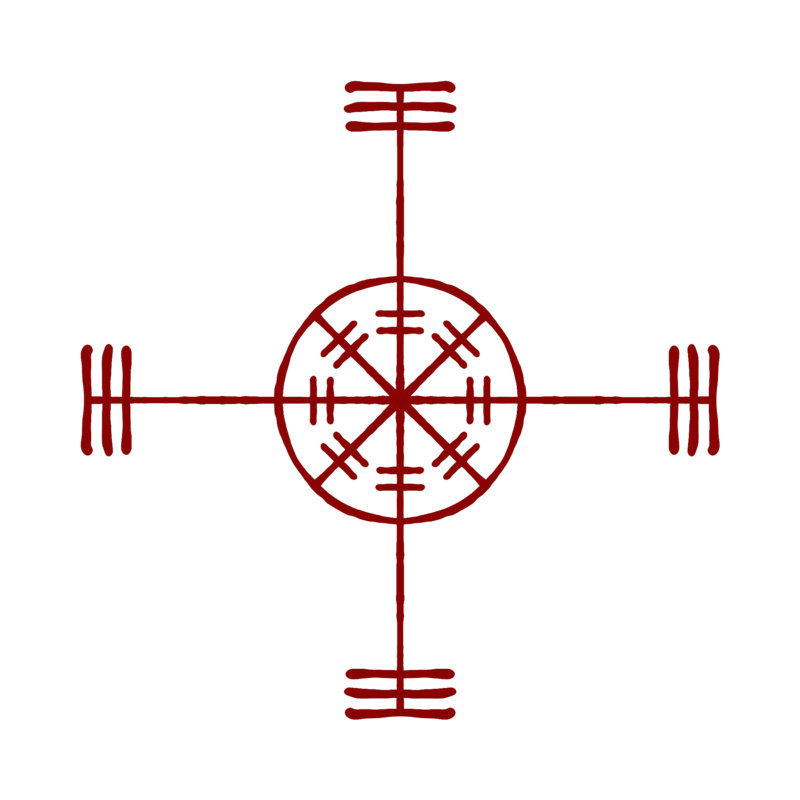 “Raudskinna” was lost to the ages unfortunately, as the story says the Bishop took it with him to his grave. 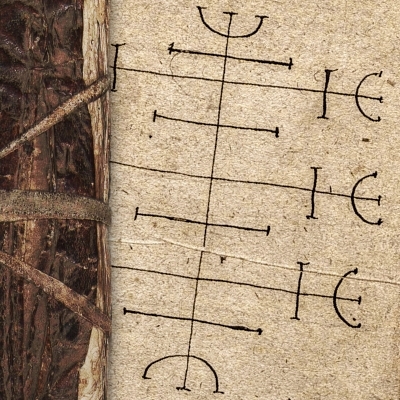 The Galdrabók that I’m sharing with you guys here however, is one of those manuscripts that survived. It’s actually one of the more infamous of the surviving black art books that we still have. It’s a small book compiled on parchment, consisting of 32 sheets in all. 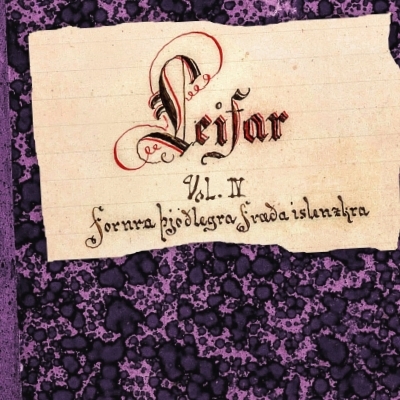 The oldest parts of the document were written down in Iceland sometime during the 16th century. 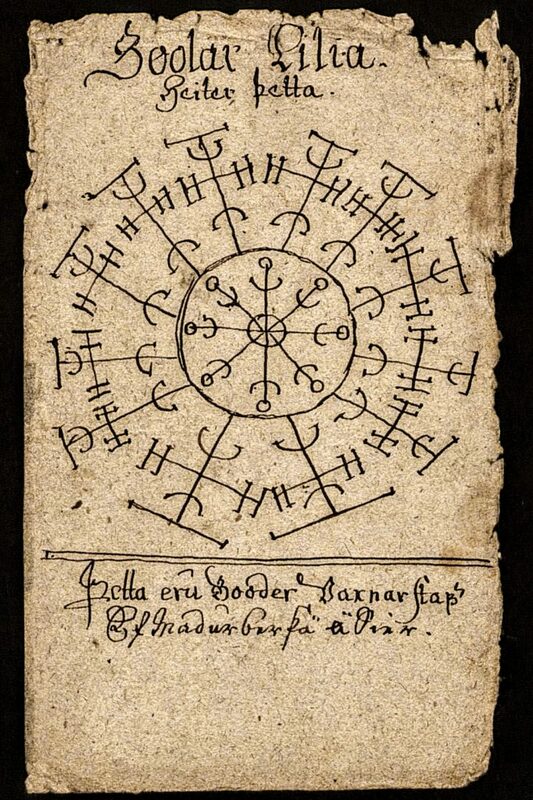 Later, the book found its way to Denmark, and at the beginning of the 17th century a Danish Troldmand (sorcerer) supplemented the manuscript with more content. Alas, a more exact date for when this happened is obscured, along with the names of those who wrote the text. 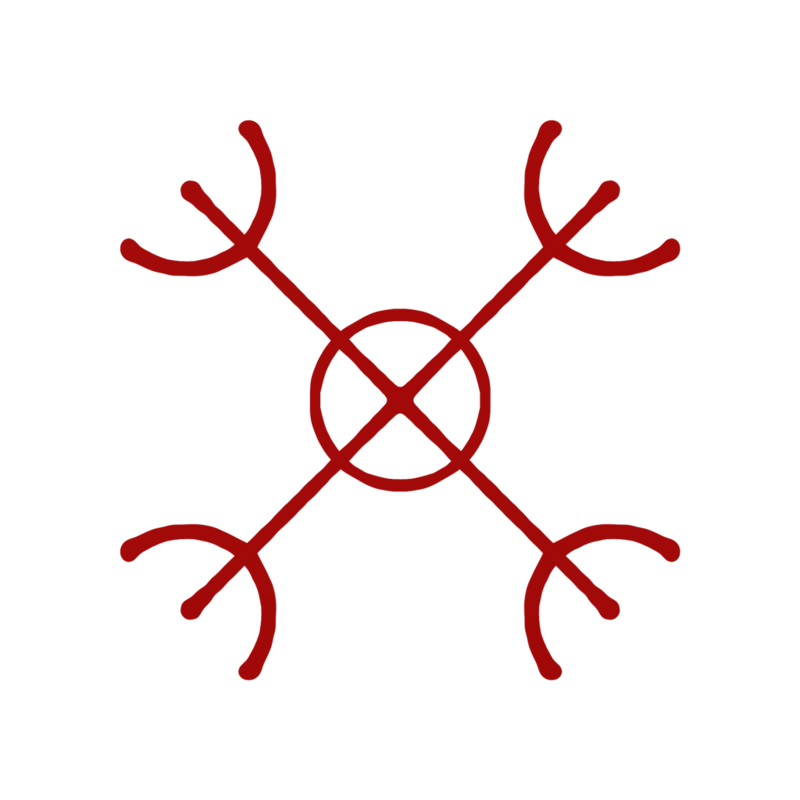 Some of the content is likely to originate from other Galdrabóks, but it’s really hard to say at this point. In 1682 the manuscript was bought in Copenhagen by the Swedish language- and forn-researcher Johan Gabriel Sparfwenfeldt. During 1689-1694 he worked hard on collecting several “gothic” memorials and manuscripts for the Swedish Antiquity Archive. In 1786 the Swedish Antiquity Archives was placed under management of the Royal History and Antique Academy, and this is where the manuscript can be found today – indexed and shelved as ATA ÄMB2. As always this PDF is free to download, free to print and free to share digitally! Rist these staves on red spruce and sleep on them, then you may dream of what you want in your sleep. 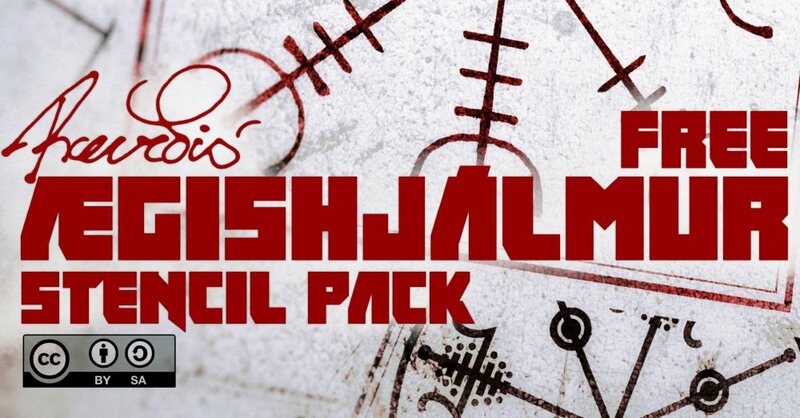 As teased a bit earlier this month, a stencil pack containing various examples of the Ægishjálmur is now available. I decided to start structuring these files inside a Google-drive archive, both for easy access as well as for easy updates and editing from my end. 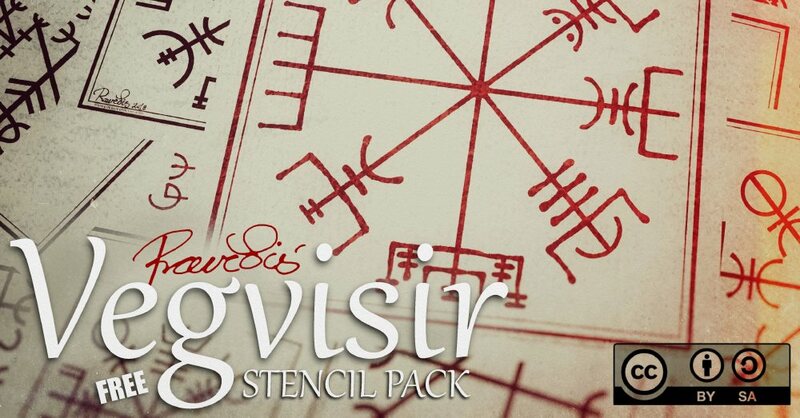 As of today the archive contains two folders, one for the Ægishjálmur and one for the Vegvisir. As I progress with my work, more content will be made available in this folder. Everything contained in the archive will be under the same CC licence, meaning that you basically can use it in any way you see fit, as long as you remember to give credit and don’t alter the licence on any work containing the files I’m sharing. 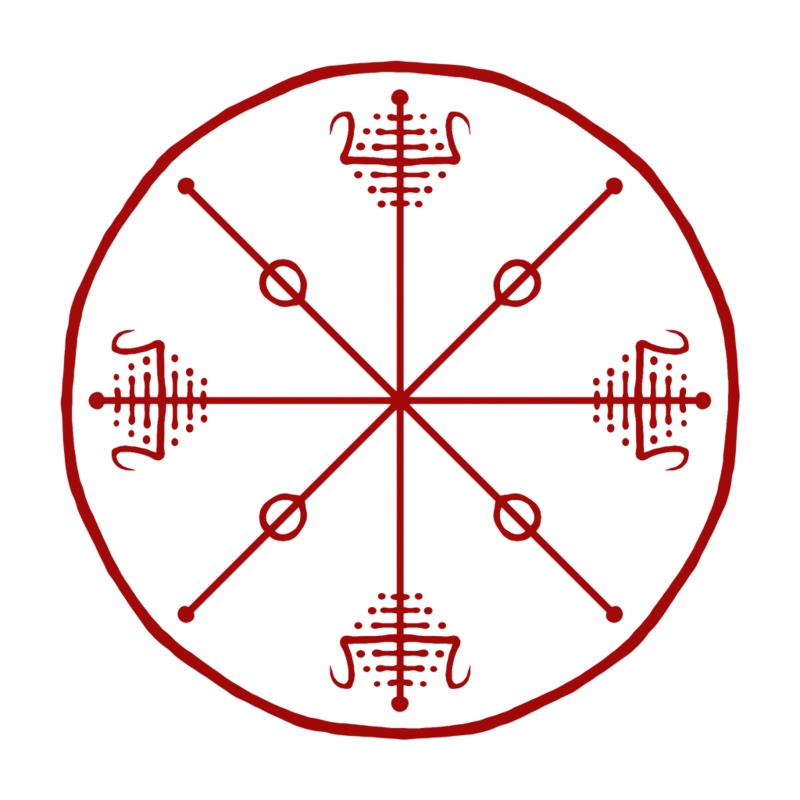 Over the years, I have had a few tattoo artist contacting me, regarding getting their hands on some good quality artwork for stencils.I have also had quite a few people looking to get a tattoo done, asking me for a good copy to use as a stencil. Since I have been hard at work doing content for my book, I figured I might as well make some of this work available for public use. 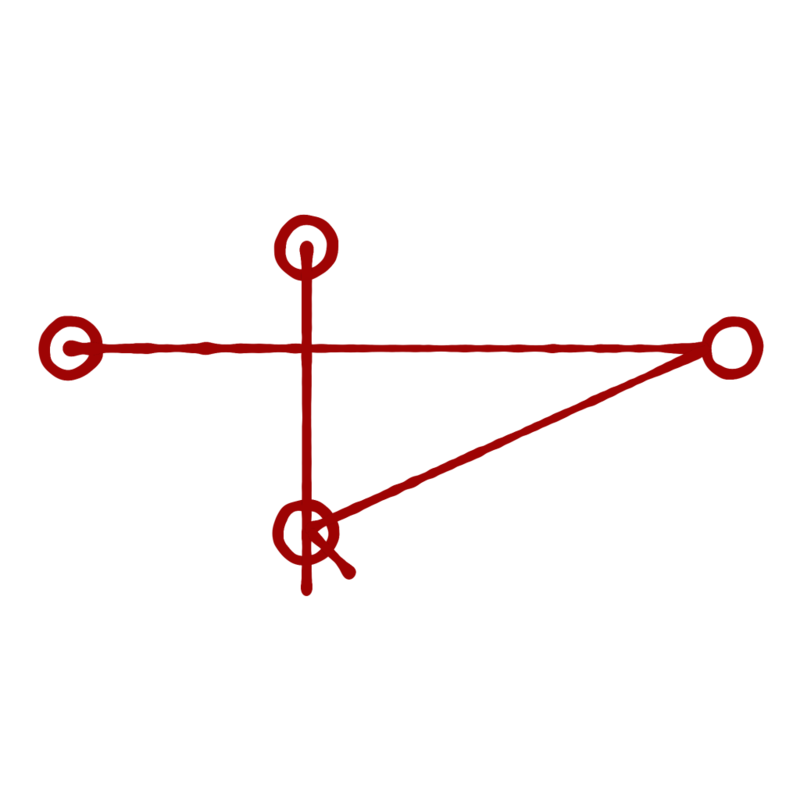 The following graphics are remastered versions of known graphical galdr or Galdrastafir found in Public Domain. The remastered versions seen here are hereby shared with a CC BY SA 4.0 Licence. 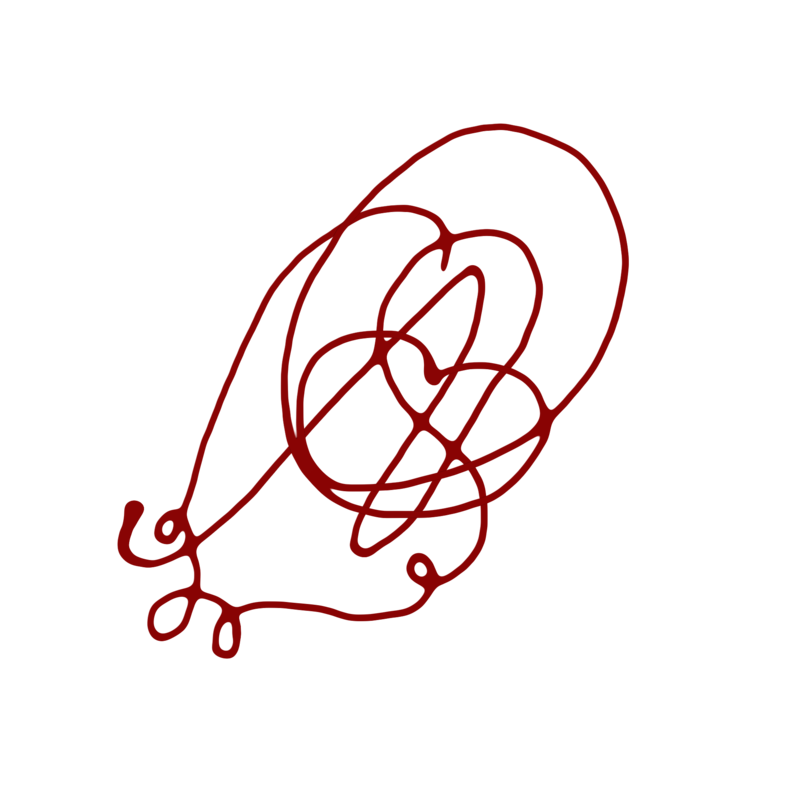 The designs found in this post and the attached zip-folder can be copied and redistributed in any medium or format, as well as remixed, transformed, and built upon in any way and for any purpose, even commercially. 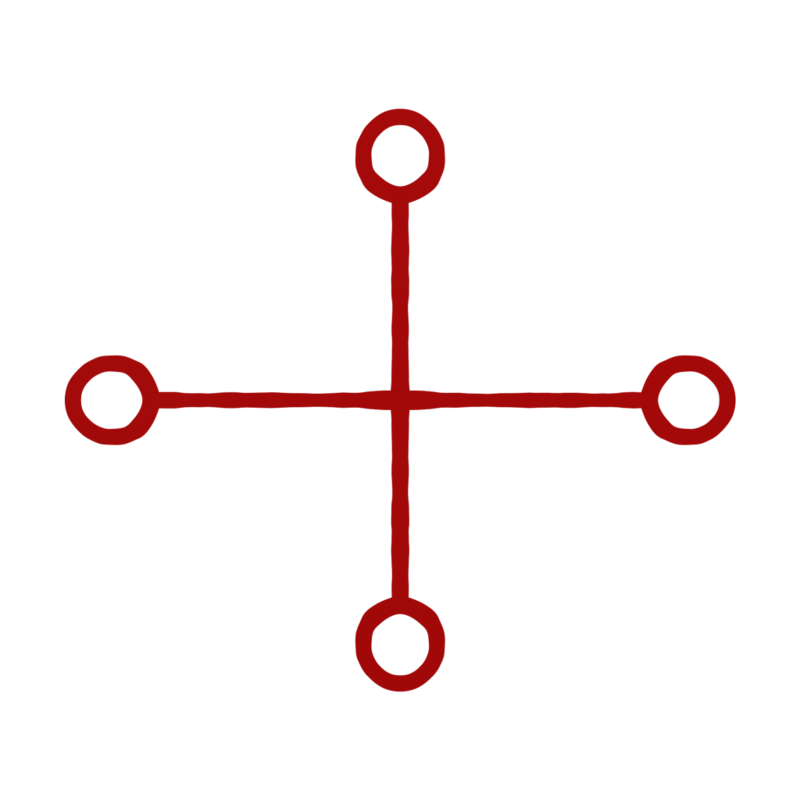 Basically this means that you can print these out, use them as stencils, display them and in any other way reuse and share them as you wish. The only demands are that you give appropriate credit, and provide a link to the license, and indicate if changes were made. You may do so in any reasonable manner, but not in any way that suggests the licensor endorses you or your use. If you remix, transform, or build upon the material, you must distribute your contributions under the same license as the original.